Term molecular distilled vacuum oil (or MD oil) is often used in specifications of vacuum oils especially for rotary vacuum pump oils. 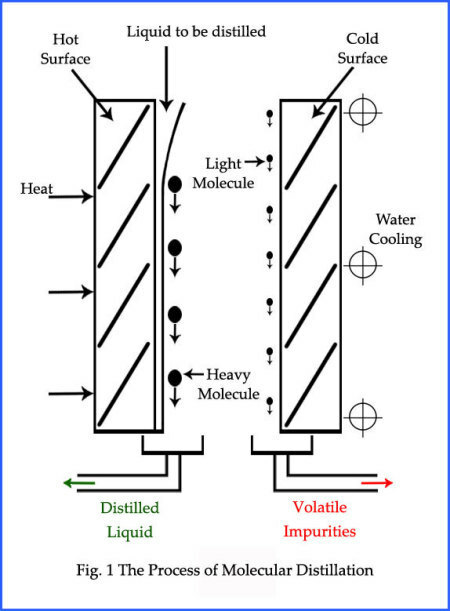 But very less literature is available on molecular distillation which creates confusion amongst maintenance engineers as to what exactly is Molecular distillation and how is it different from fractional distillation (which is a common way of distilling liquids). 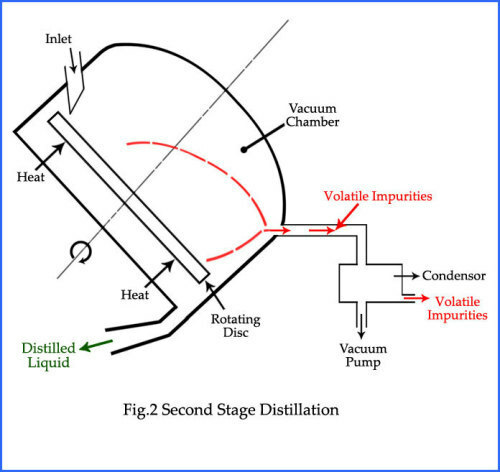 This blog post elaborates the process of molecular distillation in vacuum oils. It is special liquid-liquid separation technology, which is quite different from fractional distillation. In molecular distillation we make use of the difference of molecular mean free path of different substances. What is Molecular Mean Free Path? As we understand molecular mean free path is the average path travelled by a molecule between two strikes. In molecular distillation the liquid to be distilled is made to flow in a very thin layer in laminar flow on a heated surface. Due to heating, the liquid molecules go into vapor phase. Because of difference in mean free paths the lighter molecules will travel farther. A condensation surface is placed at an appropriate distance. Lighter molecules having longer mean free path are able to travel to the condensation surface where they condense and are guided on a separate path and removed. Heavy particles in the mean time stay close to the heated surface and are guided on a different path, separating the two. This process is carried out in vacuum. 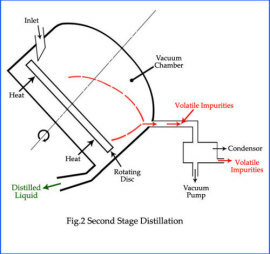 Often molecular distillation is repeated 2 or 3 times and the resultant vacuum oil is called Double Molecular Distilled Vacuum Oil or Triple Molecular Distilled Vacuum Oil. Why are Molecular distilled vacuum oils superior to normal vacuum oils? When the rotary pump starts it is at room temperature but it quickly reaches its working temperature of about 80oC. At this temperature non-molecular distilled oil will start releasing vapors of volatile impurities which will affect the vacuum level adversely and increase the vacuum time. In molecular distilled rotary vacuum pump oil the volatile impurities have already been removed so no vacuum drop will take place. In diffusion pump oil if different fractions of oil start evaporating at different temperatures then the desired vacuum level will never be achieved. Molecular distilled diffusion pump oils have oil of only one boiling temperature (single cut oil) so the desired vacuum level is achieved in a short time. 3. Both in Rotary and Diffusion Pump Oils volatile impurities will quickly be released in vacuum so the oil level will drop and the vacuum pump therefore will need frequent topping up. But not so with Molecular distilled oil. My advice to all vacuum engineers is to use only molecular distilled vacuum oils as they ensure optimal system performance.